I have noticed more and more whilst out enjoying picnics that the vintage picnic basket is becoming increasingly commonplace. We have previously extolled the virtues of owning a good quality picnic basket yet sometimes we seek something with a little more panache. Nowadays, we seem to be drawn to items that offer that little bit of a step up in quality and authenticity. Maybe it’s a case of peacocking where, to onlooking eyes, you are creating the perception of having the best. It is why you will always be told by friends and relatives when they have sourced local, seasonal produce for their shindigs and why vintage items are enjoying such a renaissance. This is not to say it is a bad thing. On the contrary, taking pride in your possessions and wanting to present yourself in the best possible light is often indicative of people who are willing to put their full time and energy into providing the best for themselves and others in whatever ventures they are leaning towards. Whenever I do spot these vintage picnic baskets, I’m always sure that the contents are going to match the quality of the basket. 1 What is a Vintage Picnic Basket? What is a Vintage Picnic Basket? This is a question that’s widely open to interpretation. If we first try to determine what vintage on its own means then we will go a long way to solving this riddle. Although vintage was originally used to describe the age of wine (or more precisely its vine), it has evolved over the last few decades to describe many things including clothing, furniture and miscellaneous items. For something to be considered vintage it is generally accepted that it is an item that is no more than 100 years old, was a fashionable item in its day and is identifiable as belonging to a certain era. Anything over 100 years old is generally considered to be antique and will not be known as vintage. Applying this to vintage picnic baskets then, we can start to understand what we should be looking for. A basket that is evocative of bygone eras, which will perfectly set the tone when you are looking to add that touch of class to your day out. You may surmise that this means you are looking for a wicker picnic basket to get that true vintage picnic feel and I would not blame you in the slightest for these thoughts. It is the first thing that pops into your mind when thinking of old-fashioned picnics and they are certainly a classic. With our understanding of what vintage means however, we can also try to search out vintage tin picnic baskets that were prevalent in the 40’s and 50’s, vintage wooden picnic baskets and also vintage woven baskets (like this one made by Gold Heart Vintage). Each possess their own unique sense of style and each will instantly let your mind wander back to times when picnics were in their hey-day. By far the most recognizable of all, wicker can be considered as the gold standard when it comes to vintage picnic baskets. My mind races when I see one, imagining what delights can be found inside. I often come to the conclusion that there is an English tea service about to be had which involves scones and cucumber sandwiches. No matter what is stored inside though, the wicker basket has served its main purpose by giving the impression of quality and authenticity. One of the best examples of a vintage looking wicker basket is this iconically styled offering from Picnic Time. I’m not sure why but when I see single handled wicker picnic baskets like this I always think of Beatrix Potter. Perhaps the quaintness of the baskets is how I see her character creations or maybe there’s a lost memory of a picnic scene in one of her books. Either way, what is not in question is the style that you are able to pull off with a basket such as this. 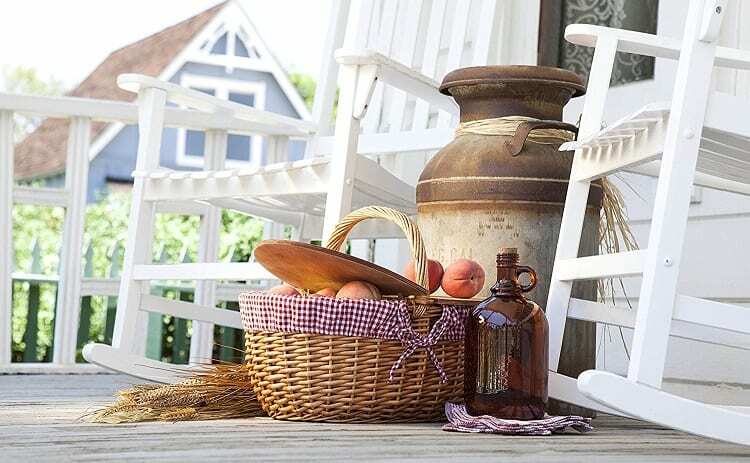 Another style of wicker picnic basket that lets me imagine a picture of days gone by is the flatter style which you could say resembles some old luggage cases. Here is a great example of what I am talking about from Trademark Innovations and if it doesn’t scream out to you, lady and gentleman on the river bank, gentleman with a Panama hat and lady in floral summer dress, then I’m not sure we can be friends. This actual set is a picnic basket for four which has plates, cups and utensils included in the price. Tin picnic baskets are coming back into fashion in a big way. Getting an original can be tricky, as with most things, but the newer designs perfectly encapsulate the era from which they originated. As a beautiful example, I would like to point you in the direction of worldmarket.com for this exquisitely decorated vintage looking picnic basket. I know for a fact that my belated grandmother would have had something very similar to this when she was younger. The decoration of fruit on the side is very reminiscent of a lot of her tin pieces that she had around her house. This basket is 12” in length and comes with wooden handles that will fold down for easy carry. Actual vintage items can be hard to source and good quality tin picnic baskets will be extremely lucky to have stood the test of time. This is not to say that finding these items is impossible. Websites like Etsy and laurelleaffarm offer some great solutions when nothing but the real deal will do. Like their wicker counterparts, vintage looking wooden picnic baskets instantly catch the eye. I prefer these baskets to be honest as they are a little more pronounced in their design compared to the twiggy nature of wicker. 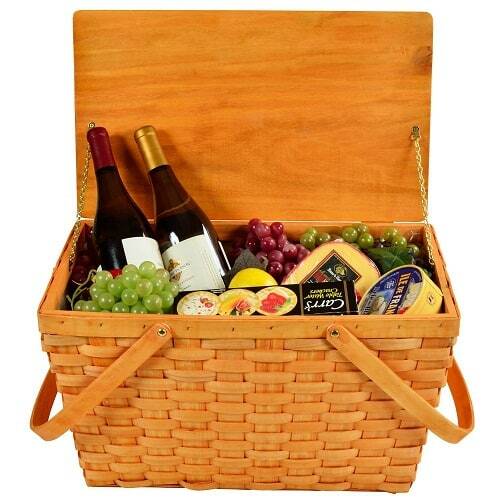 You can see exactly this quality in this vintage split wood wine picnic basket from omerohome.com. The thick woven design of the wood makes it stand out from all other picnic baskets and on this particular design it is offset ingeniously with the addition of the two slots in the middle so that you can carry your wine in complete and utter style. Picnic At Ascot offer a good looking wooden picnic basket that will be sure to turn heads thanks to its glowing honey color. It measures just under 20” in length and 11” in height. It is fully lined and hand woven and best of all comes with a lifetime guarantee.